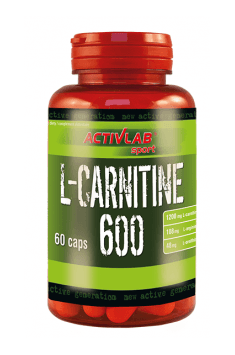 ACTIVLAB L-Carnitine 600 is a dietary supplement with a high dose of L-carnitine and fortified with L-arginine and L-ornithine. The formulation helps you reduce body fat in a healthy and safe way and improves athletic performance. It influences beneficially cellular energy production, strengthens the heart and increases physical performance. It is recommended especially for physically active individuals. L-carnitine is a biologically active form of the amino acid carnitine. The human body is capable of synthesising it, but this process is quite complex and requires not only lysine and methionine) but also the presence of several vitamins (among others, large amounts of vitamin C and B vitamins). L-carnitine may be also supplied in diet Its best source is meat (beef, pork, lamb) and smaller amounts are found in plant products (cereals, soya and avocado). About 98% of L-carnitine is accumulated in skeletal muscles. Trace amounts are found in the blood and liver. L-carnitine has a real impact on energy production in the body. Its activity is closely correlated with mitochondrial function – it helps transfer hydrophobic fatty acids through mitochondrial membranes to mitochondria. Then they are oxidised and metabolised to release energy that is essential to life. L-carnitine may be taken by healthy persons who want to improve mitochondrial function and increase energy levels. It can work well for older, ailing persons and those suffering from genetic disorders resulting in a decrease in energy production. L-carnitine helps lose excess body fat. The above mechanism of action of this compound results in an improvement in energy production from fats. Increasing the body's ability to burn fat has a positive effect on the rate of weight loss. Studies on obese individuals have shown that patients from a group taking L-carnitine lost on average 2.9 kg more than the placebo group. L-carnitine helps improve athletic performance. It has been observed that better results are obtained by combining L-carnitine with regular physical activity. By optimising energy production, this compound gives you the strength to train effectively. It may also delay the onset of first symptoms of fatigue during intense physical activity. L-carnitine helps normalise the lipid profile. It seems that an improvement in energy metabolism of fatty acids leads to a decrease in cholesterol and triglyceride levels. It is of vital important in cardiovascular prevention. L-carnitine may reduce the risk of type 2 diabetes. One of the studies have shown that it has a beneficial impact on the enzyme AMPK which improves the body’s ability to use carbohydrates effectively. Scientists showed that the response of the body to a carbohydrate-rich meal improved in patients with type 2 diabetes who were given L-carnitine. L-arginine is an amino acid found naturally in the body that is used for the production of nitric oxide. Nitric oxide helps relax vascular smooth muscles and thus widen the lumen of arteries, thereby increasing blood flow. As a result, it promotes the nourishment and oxygenation of muscle tissue. This contributes to improving your performance and allows you to do harder workouts. Visually, it causes an increase in muscle volume (so-called muscle pump) which is very desired by athletes. L-ornithine is the next amino acid which has synergistic effects with arginine, helps metabolise it and improve its utilisation in the body. Systemic activity of ornithine is associated closely with the urea cycle which is aimed at neutralising the toxic ammonia. Body detox is not the only advantage of ornithine. This amino acid may also promote the release of growth hormone, which is very desired by athletes, and helps exploit anabolic potential of insulin. To sum up, ACTIVLAB L-Carnitine 600 is a very good combination of three compounds which should be added to supplementation regimen of every athlete. The formulation helps you improve your physique and speeds up body fat reduction. What is more, it has a beneficial impact on exercise capacity and thus allows you to increase your efficiency during training sessions. Take 2 capsules daily before workout. Take 2 capsules daily or not take it at all. L-carnitine supplementation is indicated especially for vegans and vegetarians because they are at increased risk of deficiency due to the lack of animal products in their diet. The standard daily dose is 600-2500 mg. The manufacturer recommends to take 2 capsules daily. On training days, it is suggested to take them 30-60 minutes before a workout. L-carnitine should not be taken with a meal. On non-training days, the dose can be reduced or taken at any time on an empy stomach. L-carnitine, anti-caking agent E470b, L-arginine, acidity regulator - citric acid, capsule (gelatin, E171 dye).